Rapidly developing (acute) ascites can occur as a complication of trauma, perforated ulcer, appendicitis, or inflammation of the colon or other tube-shaped organ (diverticulitis). This condition can also develop when intestinal fluids, bile, pancreatic juices, or bacteria invade or inflame the smooth, transparent membrane that lines the inside of the abdomen (peritoneum). However, ascites is more often associated with liver disease and other long-lasting (chronic) conditions. An increase in the pressure within the branches of the portal vein that run through liver (portal hypertension). Portal hypertension is caused by the scarring that occurs in cirrhosis. Blood that cannot flow through the liver because of the increased pressure leaks into the abdomen and causes ascites. Computed tomography scan (CT) — An imaging technique in which cross-sectional x rays of the body are compiled to create a three-dimensional image of the body's internal structures. Interferon — A protein formed when cells are exposed to a virus. Interferon causes other noninfected cells to develop translation inhibitory protein (TIP). TIP blocks viruses from infecting new cells. Paracentesis — A procedure in which fluid is drained from a body cavity by means of a catheter placed through an incision in the skin. Systemic lupus erythematosus — An inflammatory disease that affects many body systems, including the skin, blood vessels, kidneys, and nervous system. It is characterized, in part, by arthritis, skin rash, weakness, and fatigue. Dietary alterations, focused on reducing salt intake, should be a part of the treatment. In less severe cases, herbal diuretics like dandelion (Taraxacum officinale) can help eliminate excess fluid and provide potassium. Potassium-rich foods like low-fat yogurt, mackerel, cantaloupe, and baked potatoes help balance excess sodium intake. "Hepatic and Liver Disorders." The Meck Page. April 20, 1998. http://www.merck.com. abnormal accumulation of serous fluid (edema) within the peritoneal cavity. It may be associated with any of numerous disorders, including neoplastic and inflammatory disorders of the peritoneum that produce increased permeability of the peritoneal capillaries; severe hypoalbuminemia from any cause; portal hypertension associated with cirrhosis of the liver, advanced congestive heart failure, and constrictive pericarditis; and hyperaldosteronism with increased retention of sodium and water. adj., adj ascit´ic. In portal hypertension there is increased pressure within the sinusoids and hepatic veins. As the pressure increases there is movement of protein-rich plasma filtrate into the hepatic lymphatics. Some of the fluid enters the thoracic duct, but if the pressure is high enough, the excess fluid will ooze from the surface of the liver into the peritoneal cavity. Because the fluid has a high colloidal osmotic pressure owing to its high protein content, it is not readily reabsorbed from the peritoneal cavity. Treatment. Because ascites is symptomatic of an underlying disorder that can range from liver failure to endocrine disease, treatment of the primary disorder is a major goal. The problems of fluid and electrolyte imbalance that are associated with ascites, and the potential for mechanical trauma due to pressure against internal organs adjacent to the abdominal cavity necessitate some kind of symptomatic relief. Medical treatment includes restriction of fluid and sodium intake and administration of diuretics. Supplementation of potassium and chloride may be necessary during diuretic therapy to avoid an imbalance of these electrolytes. Careful measurement of intake and output is essential, and laboratory values for the electrolytes must be monitored frequently. Surgical treatment was at one time almost entirely limited to abdominal paracentesis for removal of large accumulations of ascitic fluid. It is, however, only a temporary measure that poses problems of rapid fluid shift, loss of protein, and the potential for introducing infectious agents into the peritoneum. A more effective procedure is the insertion of a peritoneovenous shunt (LeVeen shunt), which provides a means for continuous reinfusion of ascitic fluid into the venous system. 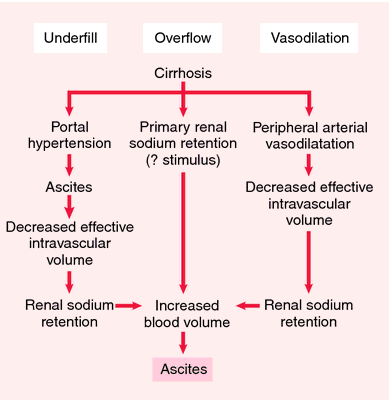 Pathogenesis of ascites: different theories. Three important factors in the production of ascites in cirrhosis are portal hypertension, hypoalbuminemia, and hepatic blockage of lymphatic flow with local overproduction. From Aspinall and Taylor-Robinson, 2001. How to measure abdominal girth of a patient with ascites. 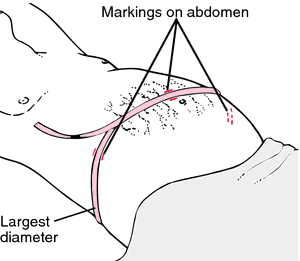 With patient supine, the tape measure is brought around the largest diameter of the abdomen and a measurement is taken. Before the tape is removed, the abdomen is marked along the sides of the tape on the flanks (sides) and midline to ensure that later measurements are taken in a consistent manner. Redrawn from Ignatavicius and Workman, 2002. (see accompanying illustration), recording daily weight gain and loss, and determining the extent to which pressure from the fluid is interfering with respiration, circulation, and digestion. Most patients with ascites are more comfortable in high Fowler's position. When a change of position is necessary to maintain integrity of the skin and promote circulation, small pillows can be used to support the rib cage while the patient is lying on the side. Ascites is usually a chronic condition that is difficult to control. Management must include instruction to the patient and significant others, particularly the caregivers who will help with home care. Accumulation of serous fluid in the peritoneal cavity. chyliform ascites , chylous ascites the presence of chyle in the peritoneal cavity owing to anomalies, injuries, or obstruction of the thoracic duct. An abnormal accumulation of serous fluid in the abdominal cavity. an abnormal intraperitoneal accumulation of a fluid containing large amounts of protein and electrolytes. Ascites may be detectable when more than 500 mL of fluid has accumulated. The condition may be accompanied by general abdominal swelling, hemodilution, edema, or a decrease in urinary output. Identification of ascites is made through palpation, percussion, and auscultation. Ascites is a complication, for example, of cirrhosis, congestive heart failure, nephrosis, malignant neoplastic disease, peritonitis, or various fungal and parasitic diseases. It is treated with dietary therapy and diuretic drugs; abdominal paracentesis may be performed to relieve pain and improve respiratory and visceral function by relieving the pressure of the accumulated fluid. A peritoneovenous shunt may be surgically inserted to drain the ascites via a tube from the peritoneal cavity to the superior vena cava. See also paracentesis. ascitic, adj. The pathological accumulation of serous fluid in the peritoneal (abdominal) cavity, which common in the decompensated (advanced) liver disease and develops in 50% of those with cirrhosis; patients with cirrhosis who develop ascites have a 50% 2-year survival. Abdominal distension which, if extreme, causes shortness of breath, portal hypertension and water and Na+ retention. • Liver—Cirrhosis, alcoholic hepatitis, massive metastases to liver, fulminant hepatic failure, vascular compromise (cardiac failure), Budd-Chiari syndrome, portal vein thrombosis, veno-occlusive disease, fatty liver of pregnancy. • Extrahepatic—Peritoneal carcinomatosis, peritoneal TB, biliary or pancreatic ascites, nephrotic syndrome, serosal inflammation. Hypoalbuminaemia, specific gravity < 1.010, protein content of ≤ 3%. Paracentesis, decreased Na+ in diet, diuretics, liver transplant, peritoneal shunt, transjugular intrahepatic portosystemic shunt (TIPS), extracorporeal ultrafiltration and reinfusion. GI disease A pathologic accumulation of serous fluid in the peritoneal–abdominal cavity, common in decompensated–advanced–liver disease, that develops in 50% of those with cirrhosis; Pts with cirrhosis who develop ascites have a 50% 2-yr survival Etiology-hepatic Cirrhosis, alcoholic hepatitis, massive metastases to liver, fulminant hepatic failure, vascular compromise–cardiac failure, Budd-Chiari syndrome, portal vein thrombosis, veno-occlusive disease, fatty liver of pregnancy extrahepatic origin Peritoneal carcinomatosis, peritoneal TB, biliary or pancreatic ascites, nephrotic syndrome, serosal inflammation Clinical Abdominal distension which, if extreme, causes SOB, portal HTN, water and Na+ retention Lab Hypoalbuminemia, specific gravity < 1.010, protein content of ≤ 3% Treatment Paracentesis, ↓ Na+ in diet, diuretics, liver transplant, peritoneal shunt, transjugular intrahepatic portosystemic shunt–TIPS, extracorporeal ultrafiltration and reinfusion. See Dialysis ascites, Malignant ascites. Accumulation of serous fluid in the peritoneal cavity. May be a complication of cirrhosis, congestive heart failure, malignancy, or peritonitis. 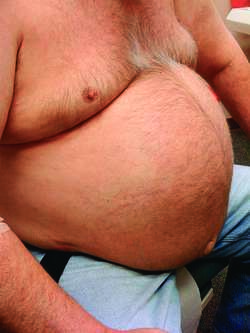 Ascites may be caused by interference in venous return of the heart (as in congestive heart failure), obstruction of flow in the vena cava or portal vein, obstruction in lymphatic drainage, disturbances in electrolyte balance (as in sodium retention), depletion of plasma proteins, cirrhosis, malignancies (such as ovarian cancer), or infections within the peritoneum. Ventilatory effort, appetite and food intake, fluid intake and output, and weight are assessed. The patient should be advised to limit fluid intake to about 1.5L daily and be educated about a low-sodium diet. Both of these interventions may limit or slow the reaccumulation of fluid in the peritoneum. Abdominal girth is measured at the largest point, and the site marked for future measurements. Paracentesis, if necessary, is explained to the patient. Emotional and physical support are provided to the patient throughout the procedure. Desired outcomes include eased ventilatory effort, improved appetite, improved general comfort, and identification of the cause of the accumulated fluid. Chyle in the ascitic fluid, usually due to rupture of the thoracic duct. Ascites in the peritoneal cavity that cannot be eliminated with diuretic medications such as furosemide and spironolactone. It must be managed with high-volume paracentesis or a transjugular intrahepatic portosystemic shunt). Bloody ascites, usually due to malignancy or, occasionally, by tuberculosis. A collection of fluid in the peritoneal cavity-the space in the ABDOMEN surrounding the internal organs. Ascites occurs in HEART FAILURE, the NEPHROTIC SYNDROME and in CIRRHOSIS of the LIVER. n an abnormal accumulation of serous fluid, containing large amounts of protein and electrolytes, in the peritoneal cavity. Ascites is a complication of cirrhosis, congestive heart failure, nephrosis, malignant neoplastic disease, and various fungal and parasitic diseases. 1. abnormal accumulation of serous (edematous) fluid within the peritoneal cavity. Characterized by distention of the abdomen, a fluid thrill on percussion, a typical ground glass appearance on radiography and a positive result on paracentesis. 2. a disease of poultry with pulmonary arterial vasoconstriction associated with poor ventilation and oxygen levels, predisposed by high altitude and respiratory disease. There may be a genetic predisposition. that caused by cardiac insufficiency. affected fetuses are usually dropsical and cause dystocia, even the aborting ones; usually accompanies another defect, e.g. achondroplasia. The peritoneal masses generally have a darker whorl-like appearance on T2-weighted MRI similar to other smooth muscle tumors and there isusually a lack of ascites and omental caking. Pozzi et al found that in cirrhotic patients with tense ascites, the A wave velocity is markedly increased, the E/A ratio is markedly reduced and the deceleration time is significantly prolonged, whereas Wong et al reported prolonged isovolumic relaxation time in cirrhotic patients irrespective of the presence of ascites with significantly reduced E/A ratios only in ascitic subjects. The incidence of chylous ascites seems to be increasing because of more aggressive thoracic and retroperitoneal surgeries and with the prolonged survival of patients with cancer (4). Ascites form as a result of the underlying pathophysiology and aggravate the course of the disease. In our patient, umbilical hernia was complicated with rupture because of increased intra-abdominal pressure due to excessive crying, ascites, and severe oedema. Smaller liver size with coarse echotexture, dilated portal vein with reduced mean velocity and occasionally even flow reversal, splenomegaly, the presence of ascites and/ or pleural effusion and presence of hepatic space occupying lesion in cases of hepatocellular carcinoma are the sonographic features which help in determining the stage of CLD. Associated findings of ascites, enlarged lymph nodes and metastasis (bony/hepatic/splenic or lung) were also evaluated. Its new drug candidate could potentially commence US clinical trials in early 2017, with focus on commercialising CIPT Technology for the treatment of ascites due to liver cirrhosis. The company's initial disease target is ascites due to liver cirrhosis. These are based on the presence or absence of ascites (an accumulation of fluid that causes abdominal swelling), tumor morphology (how the tumor develops and behaves,) and the degree of the mass's vascularity (the formation of new microvessels at the base of the tumor).